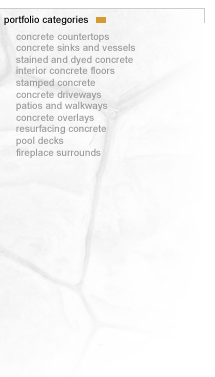 Distinctive Concrete Designs is a full service custom concrete contractor specializing in decorative concrete. Our team of professionals, with over twenty years of concrete experience, are dedicated to our client’s satisfaction through cutting-edge concrete designs that will take your project to a new level of satisfaction. Whether you are looking for a new custom concrete countertop, furniture, or an overlay to an existing sidewalk, fireplace or floor, our team will design and install a concrete product that will be unique, distinctive and one of a kind!